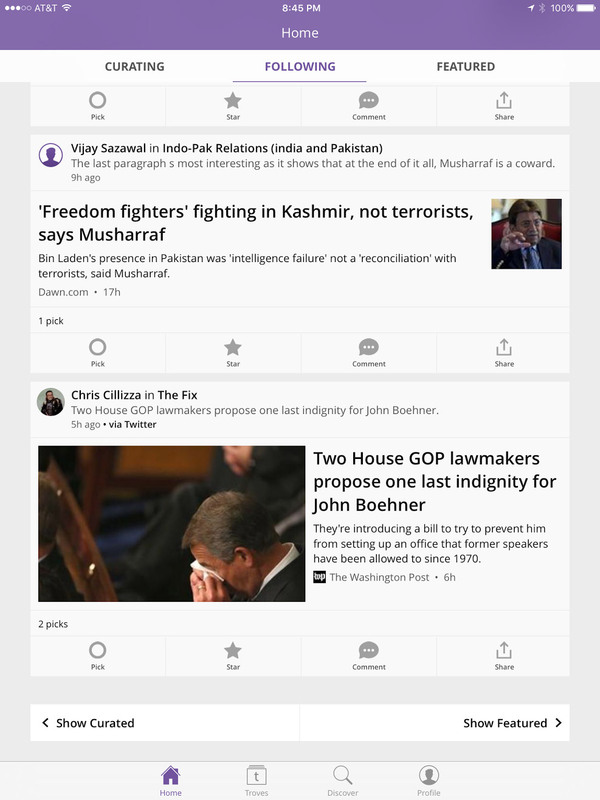 Trove was launched as a social news discovery and sharing app. Trove existed as a responsive web app and a mobile app for iOS, Android, and Amazon's Fire Phone. Trove was engineered to exceed the track record of its highly successful predecessor, Social Reader — without relying on Facebook’s Open Graph. Users connected with experts and enthusiasts over shared topics. 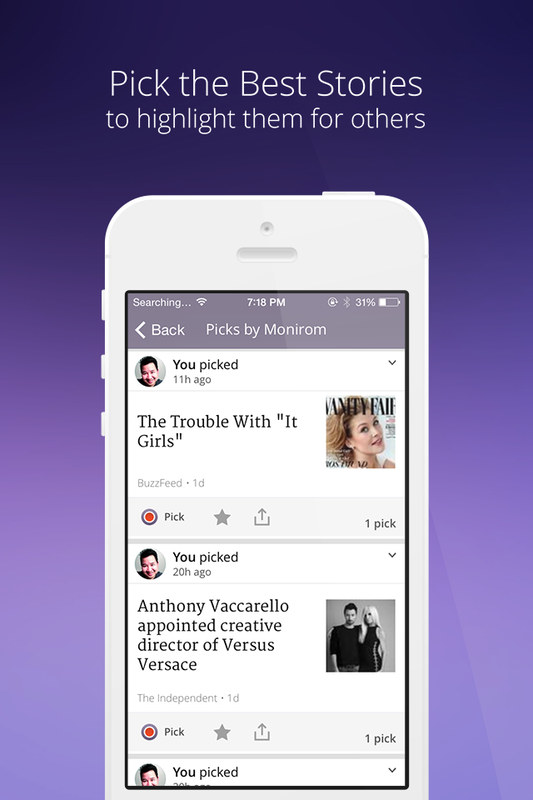 Users could curate personalized news feeds, based on their interests, called troves. Proactive Trove users picked the best stories to share with their followers. Users who only wanted to read could follow topical troves to see those picks in their home page feed. Each topical trove was crafted through a powerful combination of technology, human knowledge, and passion. Additionally, a team of editors evaluated the 15,000 new sources and 43,000 feeds for quality, and those sources fed the troves. An algorithm continuously ranked each trove's stories based on authority and timeliness. Users could create general topic troves, but Trove truly shined when the topic was focused on a specific person, place or thing. charged with: Holistic product design, design management/oversight, and hands-on design. The team behind Trove had prior experience building multiple successful products. However, the design team had been functioning without a Design Director for over six months. My challenge was to make sure UX and design had a voice within the organization and we communicated its benefits clearly. Global changes should be made only after understanding how an organization and its products function. This is especially true of any company or product with its own lexicon, e.g. the difference between a Trove and a trove. It was my job to win over the designers, gain the trust of the stakeholders, and reframe the role we played in product design. I was expected to perform triage on things that were not working. Incremental changes that would have immediate change took precedence over radical pivots. Our work encompassed the whole cycle of design and not just the interactions. Thus, I had the designers' titles changed to Product Designers. Weekly 1:1s were set-up and would occur outside the office when possible. Venting was encouraged as a form of catharsis. We focused not just on the work but, the designer's career trajectories. Conflict management was taught, as were lessons on effective communication in speech, writing, and presentation. The designers came to understand that while they all had their specialties and focus, the products belonged to everyone at Trove. This made them more receptive to critique and open to collaboration — both inside and outside the design group. A motivated design group is a productive design group. I gave my designers a generous amount of autonomy. However, that did not mean I didn't take every opportunity to remind them of the fundamentals as well as introduce them to new tools, processes and new ways of thinking. Leveraging my past life in advertising and PR, I worked with the product group to boost the impact of our visibility. Working with the product team I designed everything from banner ads to social ads to all the needed components to unify our digital footprint. Internally and externally, sometimes with the help of our sister company SocialCode, we refined the look, feel, content and messaging of our ads based on performance. What didn't work was pulled and replacement options were rapidly deployed. Trove generated no less than seven email products meant to solicit a specific response from our users. Most recipients found the Daily Digest and Welcome emails useful. The email team was relentless in analyzing the results of our products and would engage design and editorial teams to suss out the edits and tweaks needed to make the most of our communications. Over time we were more explicit with our design, timing, instructions and visual cues so subscribers understood the purpose of each email. This increased our click throughs, conversions, and kept Trove fans from unsubscribing. Examples below compare the types of emails we sent out, but it's not an apples-to-apples comparison. While we had only four designers at Trove, I was no stranger to working with a deficit. 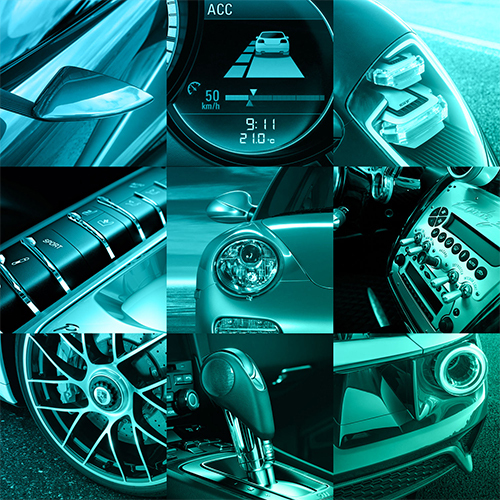 It allowed us to wear many hats and leave our mark on all the facets of product design. The designers had a healthy mix of UX/UI, iOS design/dev skills , web design/dev skills, and user testing experience; but each claimed a platform or main function as their specialty. The design group generated an ongoing, annual list of Top Ten List of Things I Would Fix. Comprised of functionality issues, pet-peeves, fit, finish and UX debt; it was our personal hit list. We'd attack this list over the course of the year, injecting these fixes into larger initiatives to provide personal resonance — while we continued to grow and evolve Trove the product. Trove struggled with user registration. Force the first time visitor to create an account without giving them a reason why and you'll lose a potential new user. We had a bigger threshold to breach on the iOS app than on the Web app. My first action as Design Director was to imbue the static sign-in screen with perceived value. We did this by minimizing choices and including a self-advancing animation explaining the benefits of signing up for Trove. Subsequent releases reintroduced social sign-in. 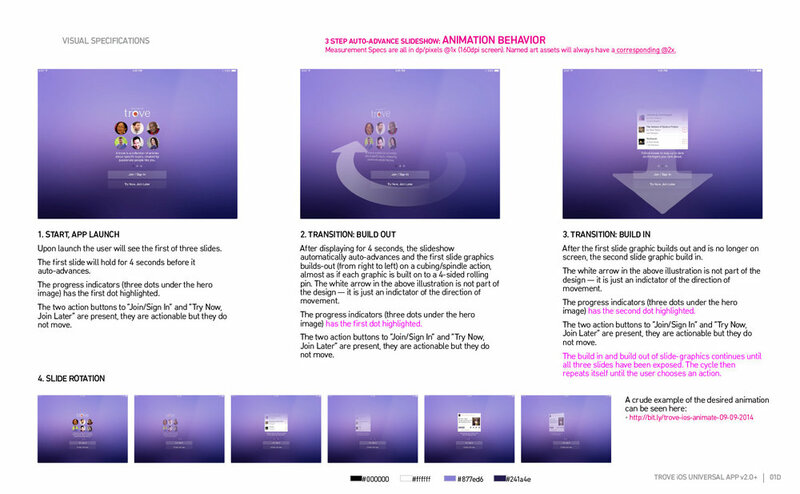 Below is the prototype animation and specifications given to our iOS dev team. Because half of our iOS dev team was overseas, I tended to err on over-documentation. The second issue I attacked with my designers was the problem of user education. We walked a fine line between getting in the user's way and not providing enough feedback when needed. As we streamlined registration, we also did away with overlays and pop-ups. We opted for a minimized tour that required user interaction to dismiss the hints. Original designs also included inline hints. The user could interact with these hints or simply scroll past them. Either way, we didn't impede their progress in getting deeper into the app. If you're the kind of person who uses RSS and Google Alerts to follow topics, Trove could be a better solution. The product's greatest strength comes from that curation concept. Originally developed for Trove's internal editorial team and power-curators, the Trove pickmarklet allowed users to add articles (outside the Trove apps) to their curated streams. It also served as a low-risk environment to test curation flows and a sandbox to try out new implementations of the Trove brand. The addition of Stars and Comments was the first major modifications made to the Trove product. We did it first on the web app with iOS immediately following. In Trove starring was a quick way for followers to provide validation to a trove's curator. It served as a virtual high-five or short hand for, "Thanks for picking this article, it resonates with me." The star animation was added to make the action more visceral and addictive. In addition to the animation I insisted on an audio cue which made it into the web app, but not the iOS nor Android UX. Our readership skewed older, spent more time reading, and were less likely to respond or tolerate clickbait. This meant when we rolled out the comments feature it generated more civil, but still interesting conversations. 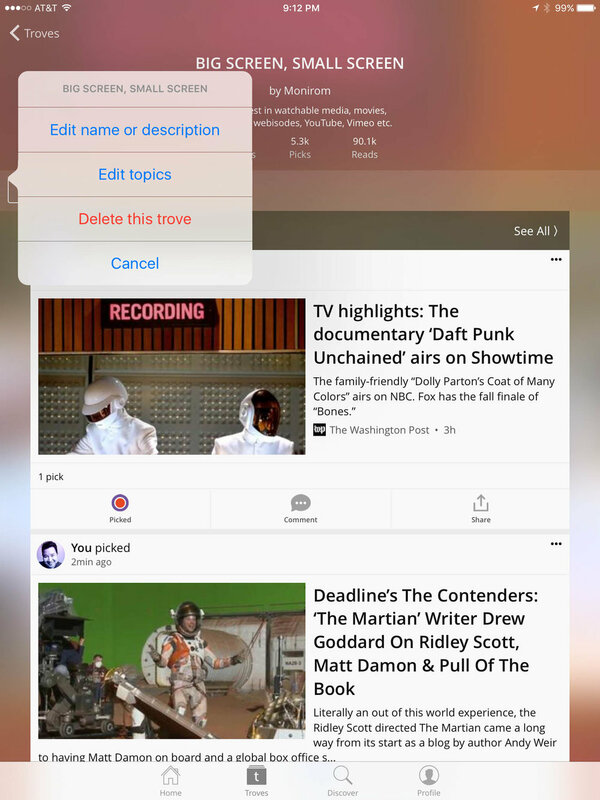 To augment in-app search and exploration of new troves a Discover section was added. More active troves and editorial staff picks were featured. We started with simple discover cards. We'd have the option to upgrade the designs after we received performance data and we had given the curators personalization features. The core action in the Trove product is the "pick", the act of a curator selecting a news article and adding it to their own trove. 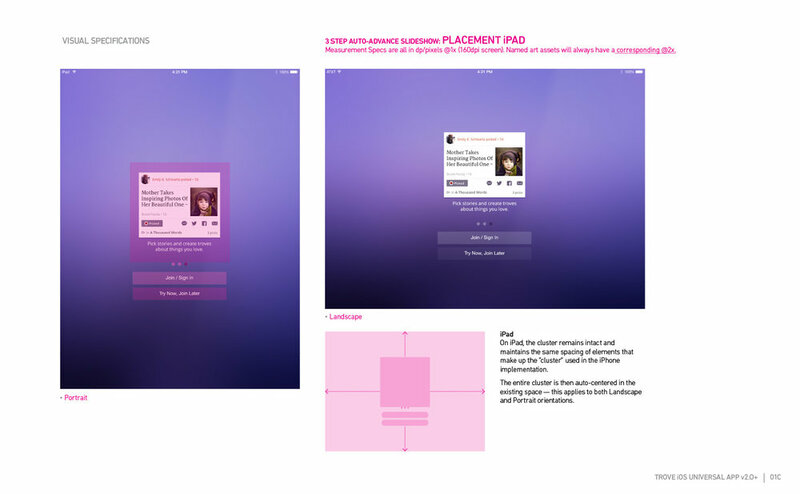 We had streamlined the pick flow within the respective iOS and Web apps, but switched to the share sheet as of iOS 7-8. The iOS platform was the first place where we were able to give users real time feedback. We showed them how their topic choices affected the news feed within the troves created. 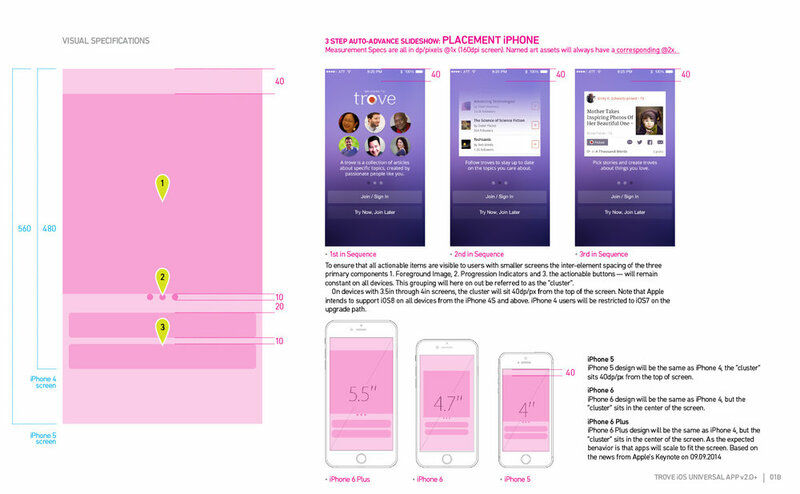 We would continue to iterate to make the experience fit in with the balance of the iOS UI. We had a strong brand, but the visual realization of that brand needed standardization and a boost in color and contrast. This was especially true when it was used in reduction and in the context of avatars and app icons. Halfway into my tenure, I gave a presentation that resulted in the adoption of an updated logotype, color palette and formal, minimal reproduction and graphic standards. On color, many thought we should have chosen a different color, but the problem wasn't color as much as our chosen hue and saturation level. Then again, we might have been ahead of the curve. The New York Times called Trove, “a treasure for news junkies.” CNBC explained, “It is as simple as creating a Pinterest board.” USA Today and The Today Show had also given us positive reviews. However, outside of the soundbites, Trove was much more. Trove’s greatest power is the ability for anyone to start a trove on a topic, and lead the news for others. Trove’s topical algorithm constantly feeds story suggestions for curators to help them do this task easier than anywhere else on the web. Trove allowed curators to expand their reach farther and faster through the integration of content. Platforms such as Facebook, Twitter and Instagram required users to do the heavy lifting of producing or introducing content to their respective networks. 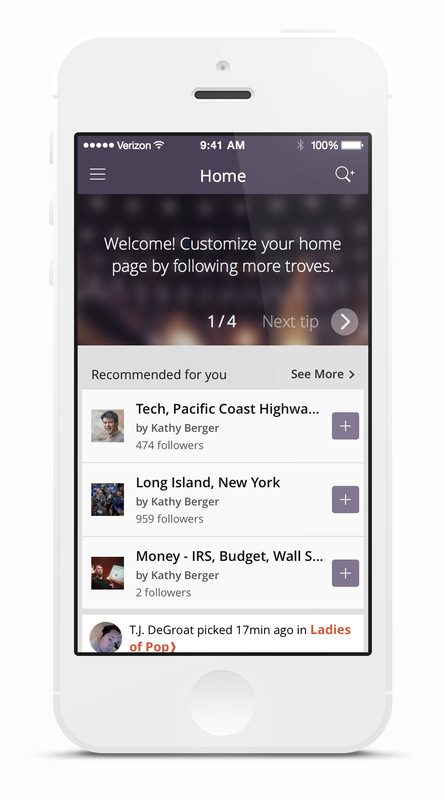 With Trove, all influencers needed to do was contextualize through a comment. Users picked stories from our ecosystem of 90+ partners, 10,000+ vetted sources, and 43,000 feeds. This would have been a game-changer during the 2016 election — the year of fake news. The beauty of Trove lay in the way users kept receiving news about topics they followed, even if a specific trove’s curator went on vacation or took a hiatus. Our users started to shape Trove in unexpected ways. Trove allowed you to create channels, aka known as troves, for topical interests that ran deep and were most relevant to you and your followers. Interests that would connect, entertain or inform followers of your trove. The essence of Trove was picking and providing a trove owner’s context to news stories picked. Many users saw this as an easy way to leverage Trove as a tool to help them become thought leaders in a chosen field or topic. PR Agencies explored how Trove might be used as an alternative to Thomson Reuters Media Briefs as well as a way to monitor issues, brands, and competition for their clients. Partner News Agencies looked at Trove as a possible white-label solution for their mobile apps. Political Campaigns and Lobbying firms saw Trove as a way to monitor constituents. Parsing local news by zip codes during election cycles allowed them to track voter sentiment. Graduate Students leveraged Trove as a research tool that would inform their master theses. For News Junkies, iCurrent’s algorithms and smart technology made it easy to curate a trove based on location, the topics, and categories you defined. For the Average User, Trove provided a way to easily manage the firehose of information that was the internet. You could choose what you wanted to read and in so doing, tune out the pablum. By the end of Q4 of my 2nd year at Trove, we had revamped the HomePage to be more inviting to both new and returning users. Twitter ingestion and auto-troves were working, stars (curator feedback by upvoting), commenting / conversations was in use, and a rapidly improving discover experience was up and running. 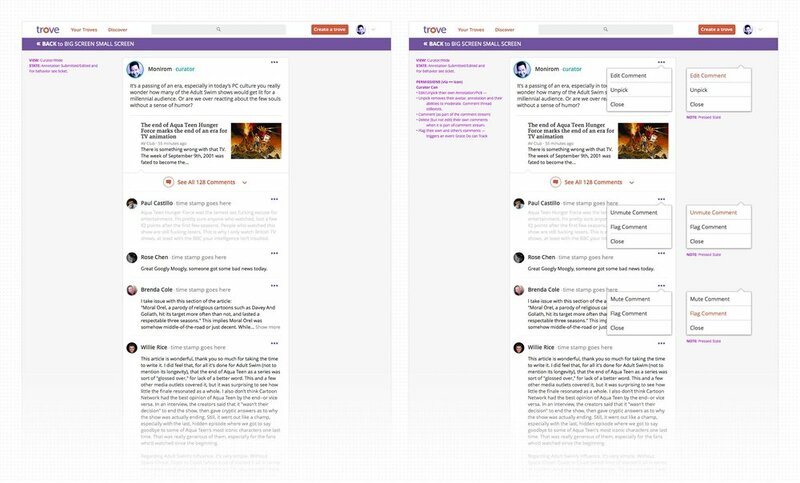 You can preview scrolling previews of the responsive home page in all three widths wide, medium, and narrow. An unvarnished look at all the views and use cases for the web app can be found here. Trove's Android experience started as a shim, and any improvements to the responsive web app would naturally migrate. Working with the dev team, we were able to translate certain browser-based actions off to native controls when it was logical. We were gauging user demand for Android support before building a pure native app. When the Amazon Fire Phone and Amazon Echo debuted, we took advantage of being one of the first properties to exploit their respective new features. On Fire phone, it was Firefly, a tool that automatically recognizes text, sounds, and objects — then offering a way to buy identified items through Amazon's online store. On the Amazon Echo, it was Alexa's capability to read the daily top headlines from Trove. 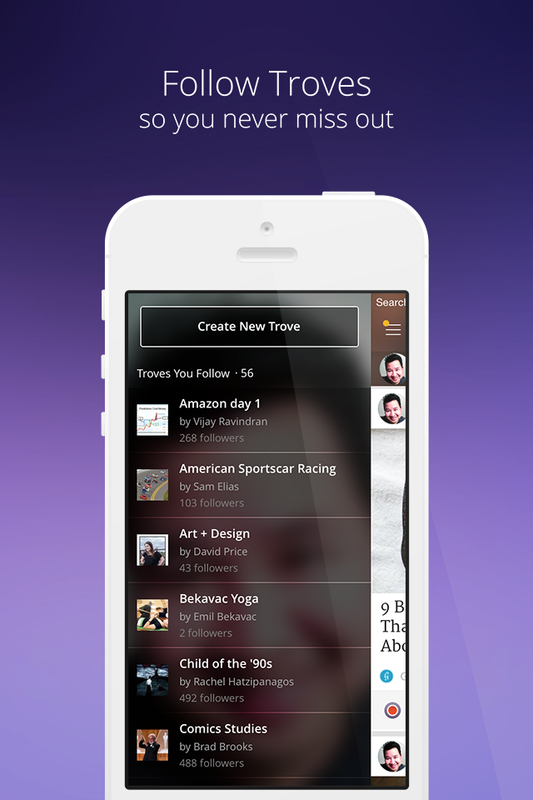 Trove for Fire phone seamlessly connected Trove’s active communities with Amazon’s user base through the Firefly plugin. 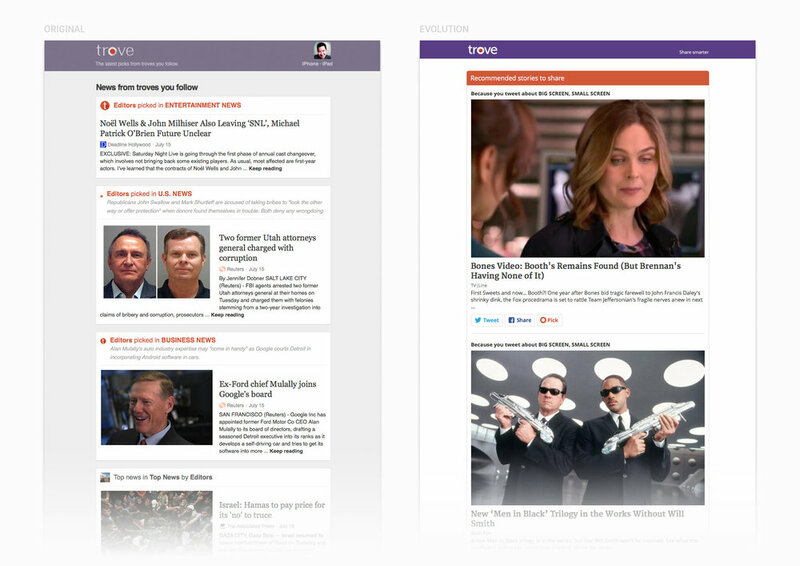 When you used Firefly to scan something, you’d see Trove results that include news articles and troves. While you shopped, reviewed, and shared with your Amazon Fire phone, you could read more about your topic of interest, including what Trove’s curators are suggesting for their followers. Web app improvements were migrated to the iOS experience when they had proven their worth. We moved away from the hamburger menu and the dual left/right menus. Originally meant to expose more content, it created more visual clutter and introduced the paradox of choice. In its place, was a streamlined tab menu that highlighted the core actions of the Trove app. We repurposed a "peek" state as a dedicated view for conversations and that respective trove's metadata. User's profiles and the troves they curated were given distinct treatments to differentiate them from news sources. e.g. (Chris Droukas' Cooking trove vs. the Bon Appétit trove). We consolidated edit controls into a single primary screen. Having inherited two diverse user experiences, we rectified this dissonance and the iPhone, and iPad experiences were truly in sync for the first time since I joined Trove. This laid the groundwork for a possible frictionless redesign. An unvarnished look at all the views and use cases for the last release of the iPad app cab be found here. With 45 days left in Q4, we were 300 shy of our target of 10,000 actively curated troves. New and existing users had only to create 10 new troves a day for the next 30 days for us to meet our target. It was one of many goals we needed to meet, but one of the most important KPIs. It looked like our goal was achievable. On November 11th, we integrated into our sister company SocialCode. 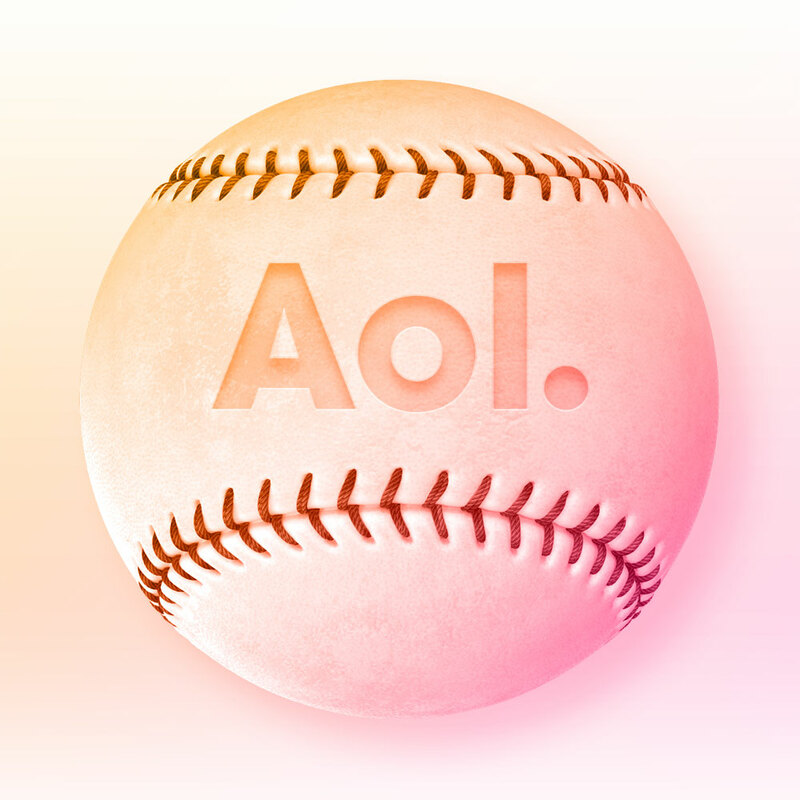 Engineers and designers would now be deployed to accelerate social marketing for the world's most valuable brands vs. defining the future of online news. Trove was sunset shortly after. People won't always use your product in the exact way you intended. These same users should not be punished if they find alternative or novel ways to leverage your product. They should be celebrated. Onboarding remains one of the most challenging and vital parts of any product experience. You can't skimp on opportunities to educate your user, and this effort must be ongoing. FAQs and contextual tips aren't enough. Nor is this the best way to teach your audience how to use your product. No matter how intuitive your product, as you add features, the need to educate new and existing users remains paramount. Pixels aren't precious. It's better to deploy an ugly solution now, than wait for perfection.